I don’t bother chilling the dough or shaping it into balls, I just scrape it into a lined 23cm x 33cm (9″ x 13″) baking pan and bake it in a preheated 150C (300F) fan-forced oven for 25 minutes. The end result, according to my boys, is halfway between a brownie and a cookie. It cuts well into squares or thin slices, as it’s reasonably firm in texture. It’s quite delicious, and was very popular when Pete’s family were here for the long weekend. 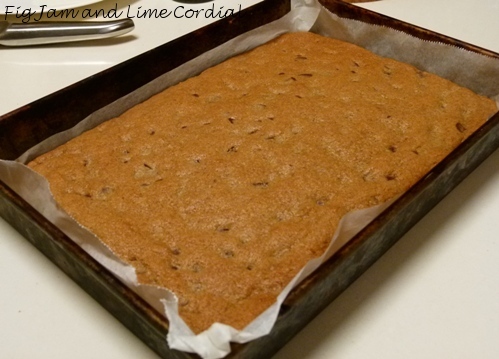 I wonder if this would work with other cookie dough recipes as well? Oh, dear… Let me politely correct you: “Lazy” and “Celia” don’t go on the the same phrase.. Ever. You see, when people get lazy they do nothing. Absolutely nothing. They sit and they stare. you? You bake an amazing chocolaty concoction that is making me swoon! 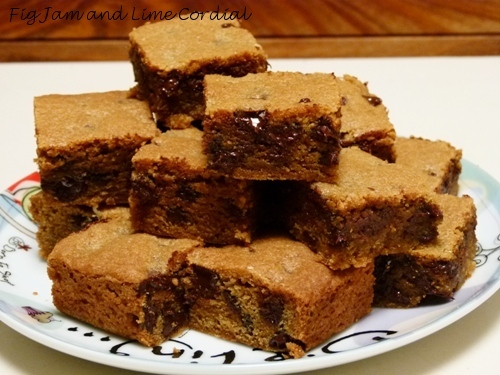 Between a brownie and a cookie – sounds like it’s what I’d like! That looks good. I’d call it a traybake and they are always popular. 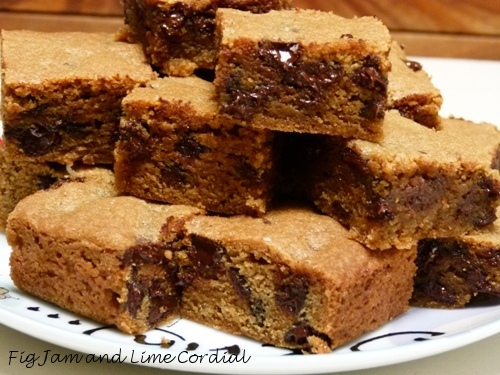 We call these Blondies (as opposed to brownies) and now I want one…not lazy, CLEVER CELIA. Thanks Emily! So that’s what blondies are! I do this with peanut butter cookie doughs- and it works just fine. I know what you mean about lazy- sometimes all those separate cookies balls just seem to take forever to dip out and bake! That sounds wonderful but I can’t imagine you ever being lazy. You seem to do more in 1 week than I manage in a month. I do get what you mean about all the individual cookies – it does get tedious. I was just reading your new post and can’t tell you how much I admire your creativity and love these ideas. I’m going to keep re-reading that one to motivate me and think about using my freezer more. I stopped freezing food years ago when I realized that whatever went in there never came back out. When we moved from our last house I finally thre out a frozen chicken that had been in there for about 6 years…pretty bad huh? I asked my husband if maybe we should move the old bird with us just for sentimental reasons but we finally tossed that guy. Not lazy, practical. I call them bar cookies. Nothing lazy about that at all. Maybe inspired though? In the UK they make flapjacks which never work for me, Anzac biscuit mix made this way might be really nice. Hi Kylie! I always mean to try making flapjacks, but have never gotten around to it. Thanks for the reminder! Very smart indeed, you never cease to amaze me. Hahaha…Mel, I guess that would work! The big thing for me is that it’s easier on the hands and wrists – they play up a bit on me occasionally! These look incredibly tasty & well-flavoured too! Yummmmmmm! have a great & fun weekend! My goodness Celia this looks utterly irresistible! Oh I was just wondering if that would work the other day! Top job :) I shall try it now!